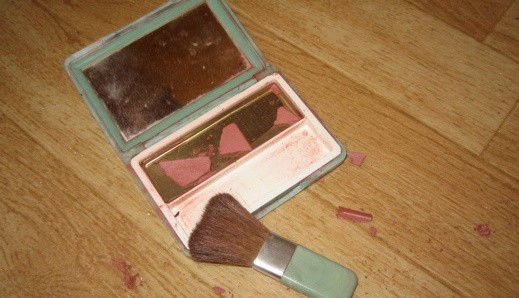 Time for new makeup. I’ve actually been meaning to post about my blush for some time, because I think it’s funny that I’ve owned the same blush for 13 years. (That’s as old as Lloyd’s students. )Â Not the same color – the same container. I got it when Todd and Kathryn Peperkorn got married ‘way back in 94. The bridesmaids went to some fancy place for makeovers, and I bought the blush. I’m not very good at putting on makeup, so I usually go without. (I also have a theory about putting colored dirt on your face, but that’s for another day.) Anyway, I’ve been slapping a little blush on in the mornings lately, and today I was in too big of a rush and dropped it. I hope they still sell ‘Fig’ at the Clinique counter. I get my forehead de-shinifier lotion at the Clinique counter. It’s kind of intimidating. The fancy ladies in white coats make me kind of skittish. And Lauren … some of us are pigment challenged … we have to use colored dirt or the pale, lifeless, a vampire just drank my blood, appearance would scare the masses. Yea…and if we don’t have brunette eyelashes and eyebrows we look, well, pale and lifeless, just like Peggy said. Not to mention, some of us, without make-up look shockingly like our oldest brother and while he’s a handsome man, he doesn’t make a very lovely woman. Ya’ reckon you’re older than dirt? I sure feel that way! I’m with you… anymore, I only wear lipstick & some powder, and I just don’t worry about the pale & lifeless part. Enjoy your blush! Oh, and don’t worry if they still have fig. You can use it broken for another 13 years! I find it simply AMAZING that you can drop or spill or knock over something and the very first thing that enters your mind is, “Where’s my camera?”! !